The boys wanted to go fishing today and take advantage of the awesome bite on the lake but wanted to sleep in so DP came over after eight and we hit the water about nine. It took us about an hour to put 150 baits in the tank then we were ready to go have some fun. It took about ten minutes for me to locate some Stripers but once we set up on them the rods started bowing. It's great to see numerous rods hooked up and the boys running all over the boat trying to catch up. I was baiting and DP was removing the fish so we could have constant action. Next thing we knew we were out of bait and the boys were wore out. 150 hits in 90 minutes, that was crazy! We were so busy we didn't even know we were getting wet from the rain. Always fun to get on the water regardless of the weather. This week myself and our guides caught and released over 1,000 Stripers. We use and highly recommend Circle hooks when releasing fish. 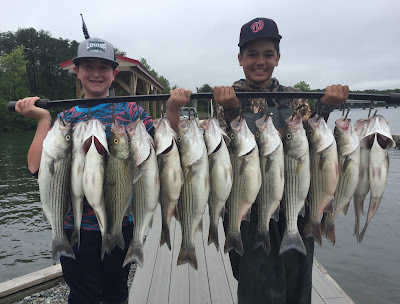 98 percent of the time the fish is hooked right in the side of the mouth allowing us to easily unhook the Stripers and return him safely back into the water. This fishery is made possible by the excellent management of the Va. Department of Game and Inland Fisheries Biologists headed up by John Odenkirk. We are seeing dozens of schools of Stripers over 200 feet wide some days at times on our side scan and we have only worked an area of the lake about 3 miles long. I will post some screenshots soon showing some of the screen shots. Come on out and join us for a memorable morning on the water fishing for Stripers and Hybrids on Lake Anna.